I’m here to make Christmas magical and eat tomatoes like apples, and I just ran out of tomatoes. I love Christmas. I love my kids. But let’s be honest with ourselves: Christmas isn’t always magical. My children are six and two, and this is the first Christmas that they both kind of understand that Christmas is a big deal. The six year old has memories from Christmases past, and it’s amazing to see him remember traditions and make connections on his own. 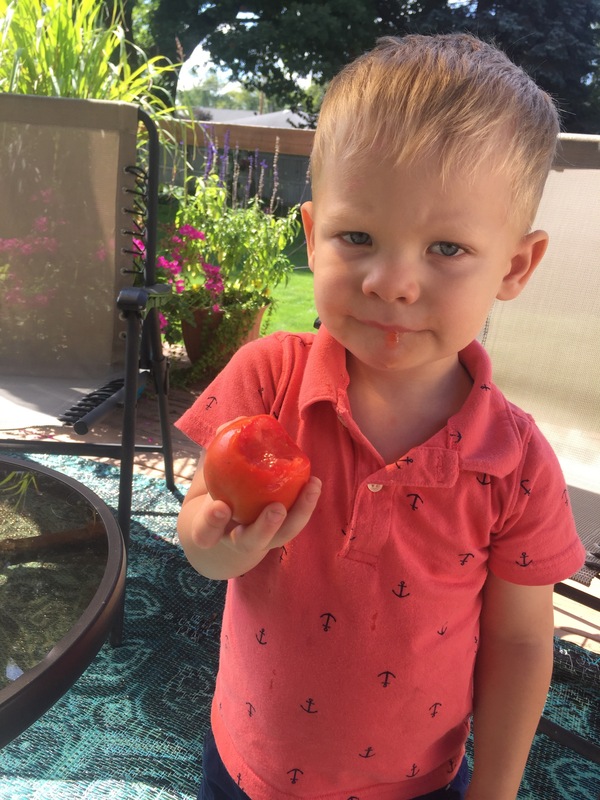 My two year old is really, really, really two. 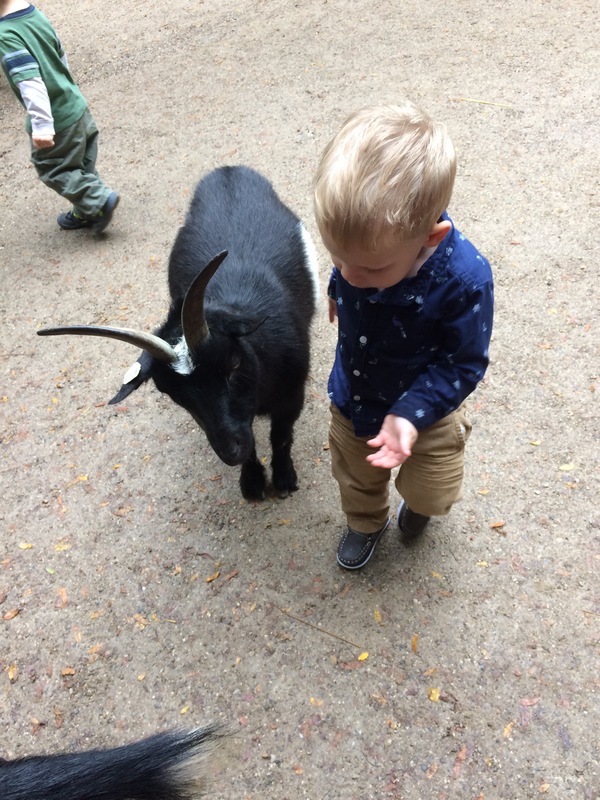 This photo has little relevance to the rest of the post, but I feel like Jonah is having a pretty intelligent conversation with that goat, and that makes me smile. Jonah is your quintessential toddler this year: he loves decorations, he can tell you that baby Jesus was born in a manger, and he looks great in a holiday sweater. He’s also broken a minimum of seven ornaments and tried to make a snowman indoors. Before I had kids, I had this ability to turn off the world on holidays, even if only for a little bit. I could step outside my body and feel peace and warmth while my family and friends spread the love of the season. That’s not to say I have never felt my share of the depression that comes with the season – I could just step away from it momentarily to soak in the magic. No small feat, I understand. But now? I have so much expectation for Christmas. Even if we aren’t your perfect television family in Christmas pajamas with perfect hair and makeup at 6am (yeah, no), we are together, laughing, embracing. There is no talk of sickness or cleaning or homework or potty training. There is simply goodness. No details. Just good. In real life, Christmas looks more like parents not feeling the coffee work fast enough while kids rip through packages so quickly they barely know what they’re opening. It looks like your toddler taking a self-imposed time out to discretely poop in a corner, inches from the potty seat that now has a permanent and disgusting place in your living room. It’s bag after bag of ripped wrapping paper and ribbons that took hours, if not days, to make your presents look perfect – only to become shreds in seconds. I think Christmas is hard because we want so much from it. I have a mantra I’m adopting this year, and I’ll be honest with you, it’s tricky. It’s countercultural and hard to live out, but here it is: Christmas is a day. Yes, Christmas is a season, and the reason for the season is life-changing, life-giving, life-saving. We should not be grateful that Jesus was born to save us all only in December. We should not show our family and friends that we love them or read the second chapter of Luke or spend time making special meals only as the calendar year draws to a close. If we can add a little more Christmas into our every day life, maybe we can remove some pressure from the one day that brings all of our stress to a head. If you’re hurting this year? If someone you love can’t be near you? If your toddler is destroying things left and right and then inexplicably screaming at you about the messes he made? Take the pressure off December 25. Christmas is a day. I hope you can find things to bring you joy all day long, but if you can’t, realize December 26 is a day too. It’s a day that can bring you just as much magic and mystery and love – if you let it.